Much debate has raged this week regarding the (presumed) Syrian bound sisters from Bradford. How could these people become so radicalised in our free and democratic society? To the rational mind it remains a complete enigma as to why anyone would choose such an irrational, immoral, preposterous and ultimately dangerous path. Some blame the internet. Some blame extremists in the local community. Some blame the radicalised brother. But regardless of where these hateful ideologies were preached from, how could such insidious ideas possibly take root? It seems to me that some groundwork has to be done first. 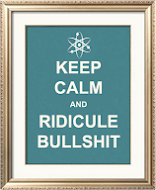 Believing in vile nonsense requires a bit of effort. Before you can believe in something utterly ridiculous and hateful, you need to first believe in something seemingly slightly less ridiculous and hateful. The best way to believe in something slightly less ridiculous is firstly to make it a cultural norm, so we stop questioning it, and secondly to make sure you start believing in it before you are capable of fully comprehending the ridiculousness of the belief. 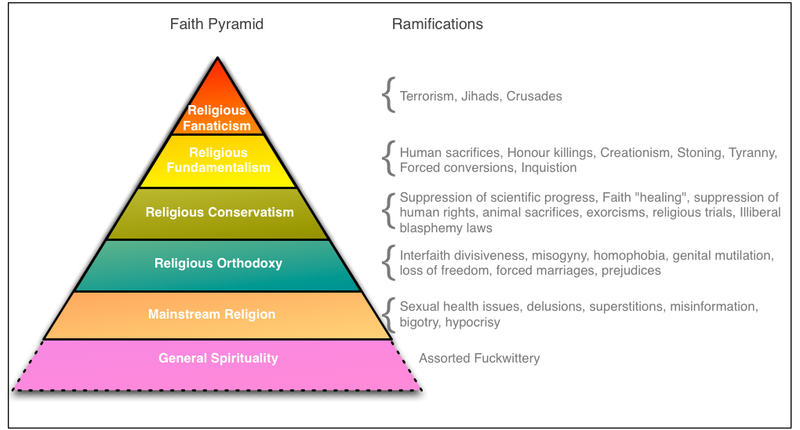 Religious fanaticism and its associated consequences could therefore be seen as having a Maslow styled hierarchy of belief. Here’s my belief pyramid and the consequences you can expect at each level. While much thought and effort is directed at tackling those at the top of the pyramid, society seems equally keen to continue fuel the system from the bottom, ensuring that we have a constant fresh supply of enough receptive minds to climb to the top of the pyramid. Of course things are a lot more nuanced than my knowingly provocative graphic suggests and I’m keen to stress that the attributes of these levels of religiosity are not restricted to any particular faith. Finally, does the general decline in religion mean that this pyramid will eventually die out, or will we just find a new base?